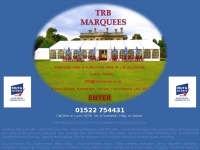 Marquee hire & furniture hire in Lincolnshire for weddings, parties, storage, corporate events, shows, Lincoln Showground. Rent your marquee and all event accessories from a small family firm. Friendly and professional service, guaranteed. SLANT Digital - Web site hosting & design - IT computer network support is specified as the websites creator. 2007 - TRB Marquees & SLANT Digital is the owner of the copyright for this website.